Carbon pricing is now in effect across most of Canada. While Ottawa implemented a backstop carbon tax for Saskatchewan, Manitoba, Ontario and New Brunswick this week, other provinces have already had federally-approved equivalents. In some cases, for more than a decade. But some businesses have raised concerns about the carbon tax’s impact on their competitiveness. In a recent interview with BNN Bloomberg, Dan Kelly, president of the Canadian Federation of Independent Business, said members of the country’s largest association of small- and medium-sized enterprises (SMEs) want Ottawa to cancel the federal carbon plan amid fears it will be bad for business. Dan Kelly, president and CEO of the Canadian Federation of Independent Business, joins BNN Bloomberg to discuss the economic impacts that await small- to medium-sized Canadian business as the carbon tax kicks into effect. He says the majority of these business will feel a financial setback. Meanwhile, in jurisdictions that have introduced their own levies on greenhouse gas emissions (GHGs), some companies say that the framework has actually helped them lower costs and improve operations, rather than create an undue burden. “We’ve found that the businesses we have worked with have shrunk their carbon footprint on average 20 per cent, while cutting costs in fuel, energy and waste,” Elizabeth Sheehan said in an email interview. Sheehan, the co-founder of B.C.-based Climate Smart, works with hundreds of SMEs to “profitably reduce” GHGs. She notes that their latest study of more than a hundred firms show a total annual cost savings of $4.5 million as a result of efforts to reduce their carbon output. Below, BNN Bloomberg looks at how some businesses have already adapted to carbon pricing systems in their respective provinces. The Listel Hotel – Vancouver, B.C. Listel Hotel offers accommodations in downtown Vancouver and prioritizes eco-friendly initiatives. How it reduced emissions: Around the time B.C. implemented its carbon tax in 2008, Listel’s general manager, Lise Magee, said the hotel decided to address what she calls “the lion’s share” of its annual emissions: Natural gas consumption. 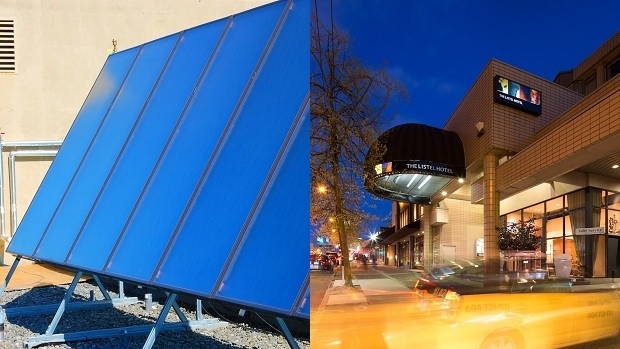 The company installed solar panels and a heat recovery system to reduceenergy spent heating water and the building itself. How it affected business: The upgrades lowered Listel’s natural gas usage by more than 25 per cent. This translated into roughly $55,000 in annual savings (with some variance based on commodity prices) after an initial total investment of $265,000, including government incentives, according to Magee. “We are focusing more and more on our triple bottom-line, not just the financial one,” Magee said. Jayman BUILT – Calgary, Alta. 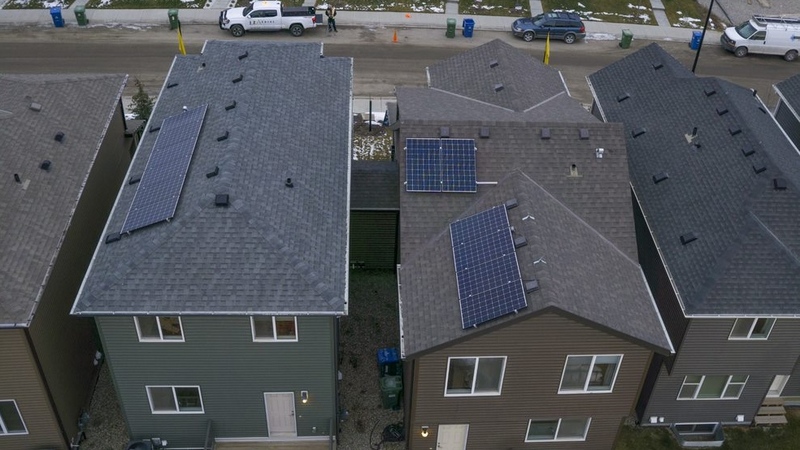 Alberta’s largest homebuilder incorporates GHG-reducing features to help slash energy costs and raise homes’ resale values. How it reduced emissions: All of the single-family homes that Jayman builds in 2019 will come with solar panels. The initiative builds on years of energy-efficient upgrades, like a new hot water system, low-flow fixtures, LED lighting, triple-pane windows, heat recovery ventilation and a furnace that uses 30 per cent less energy, the company said. “Solar is just another part of this evolution,” said Jayman President Dave Desormeaux in an email interview. How it affected business: On average, Jayman builds 750 single-family homes annually. Each six-panel solar system will cost around $5,500, offset by a $1,500 rebate from the province. “This rebate definitely helped us make our final decision to include solar – it made the economics finally work,” Desormeaux said. “[It] required very little investment, just planning and some risk taking” for what Desormeaux calls “significant increased demand” and a growing market share. “Given the tough economy in Alberta, most of our competitors have literally ‘downgraded’ their GHG-reducing features … This gap is our opportunity,” he added. Aker Solutions - St. John’s, N.L. Aker is an engineering firm servicing the oil and gas sector. Its parent company is based in Norway. Aker then developed a reduction plan. So far, $10,000 has funded equipment like occupancy sensors, programmable thermostats and reusable tableware for all three Canadian offices (including Fort McMurray and Edmonton in Alberta). Aker has also found a local partner to recalibrate equipment it previously had to fly out to the U.S.